UFC Fight Night 121: Tybura vs Werdum takes place in Sydney, Australia tomorrow and the weigh-ins took place earlier today at the Qudos Bank Arena. MMA Junkie were on the scene in Australia and reported the following weights and fines. Heavyweights Fabricio Werdum and Marcin Tybura easily made the 265-pounds weight limit. Werdum came in at 249-pounds, whilst Tybura clocked in just two pounds lighter at 247. Elsewhere on the card, things weren’t quite so simple. The women’s flyweight co-main event will take place, but Jessica-Rose Clark came in two pounds over at 128-pounds and will subsequently be fined 20% of her purse. 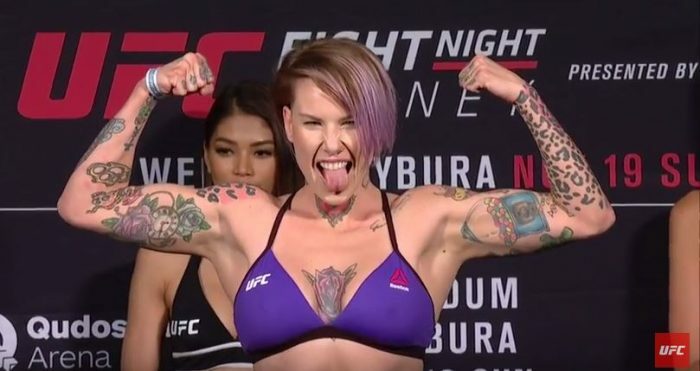 Bec Rawlings comfortably made weight at 125-pounds. The main event of the prelim card also saw one of the fighters miss the mark. Ryan Benoit came in at 129-pounds, three pounds over the flyweight weight limit and will also be fined 20% of his purse. Askhan Mokhtarian accepted the fight after hitting 125-pounds. Further down the card, Frank Camacho missed the lightweight 155-pounds weight limit by four pounds when he came in at 160-pounds who his fight with Damien Brown. Camacho will be fined 30% of his purse. One of the fighters in the UFC Fight Pass prelims also came in four pounds over when Nadia Kassem weighed-in at 120-pounds for his strawweight fight with Alex Chambers. The fight will take place, but Kassem will be fined 30% of her fight purse.